Fuchs & Fuchs Dentistry is ready to serve all of your dental needs! We are a progressive practice. The doctors and hygienist are required by law to have a minimum number of educational courses. In fact, we and our whole team always go far beyond that minimum. We pride ourselves in learning about and being able to perform the most up-to-date methods of treatment in our field. We also believe in being pro-active…in preventing health problems by aggressive methods of prevention. We want you to be healthy…but at the same time, we realize that your mouth and your body are yours! It is our job and our privilege to tell you our findings and give you options. It is however, your choice to decide how healthy you wish to try to be. We respect your decisions. The first step to allowing us to serve your dental needs is to call or email us for an appointment! We’re looking forward to meeting you and helping you with your health and your SMILE! Your oral health is our primary concern. The wide range of expertise and experience we offer ensures our patients comprehensive care in diagnostic and treatment options. 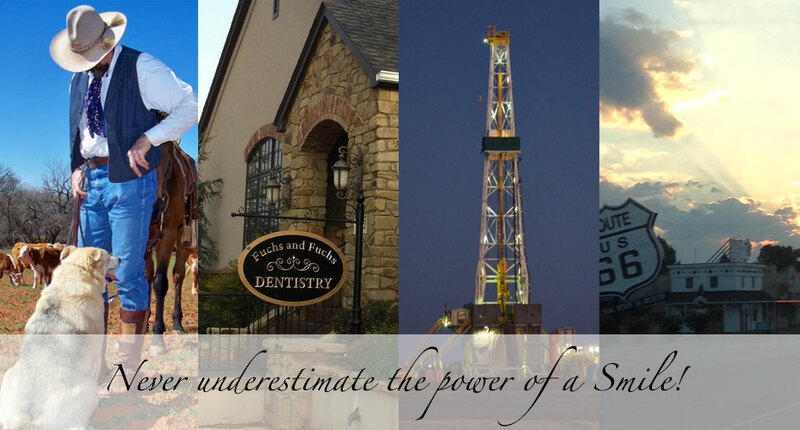 From regular cleanings, exams and x-rays to advanced restorative treatments, all of your dental needs can be met right here in our Elk City, OK dental office. Advances in cosmetic dentistry allow patients to achieve natural looking results with ease. At Fuchs and Fuchs Dentistry can help you achieve the smile of your dreams. We offer a variety of dental procedures including teeth whitening, cosmetic dental bonding, dental implants, porcelain veneers and smile makeovers.